Based on reviews from 204 experts and 6,672 users. 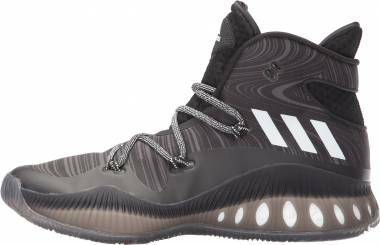 Learn how our rankings work or see our guide to black Adidas basketball shoes. Updated Apr 2019. 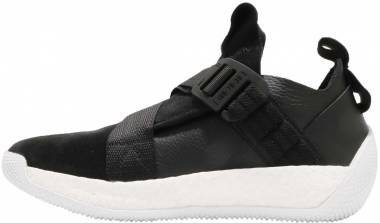 Black Adidas Basketball Shoes As Fashion? Why Not? 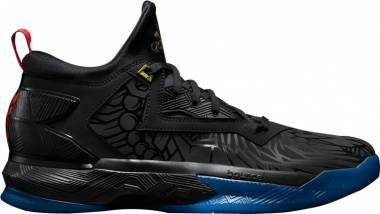 2018 has been a fruitful year for the basketball shoe industry. Plenty of shoe models were released–from fresh designs to retros to collaborations. Colorway after colorway pop out in the market, making it hard for sneakerheads and new buyers to make the decision. 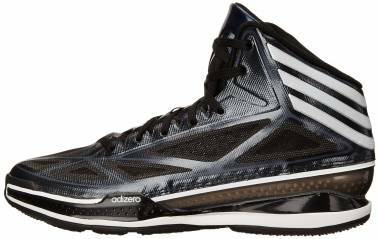 However, there are black Adidas basketball shoes that are appealing not only on the court but off it as well. 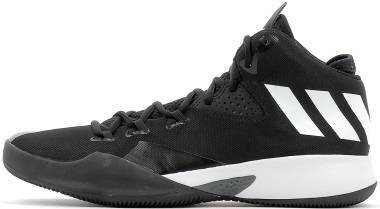 Most kicks used for daily activities are low-top and mid-top basketball sneakers. 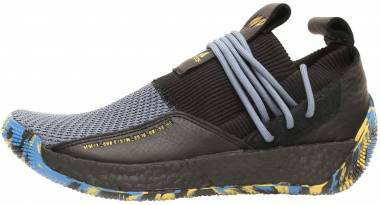 The Adidas low-top sneakers that currently make rounds online are the Marquee Boost Low and Harden Vol 3. 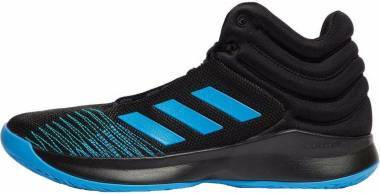 These two have received overwhelmingly positive feedback on how greatly they look and perform on and off the court. 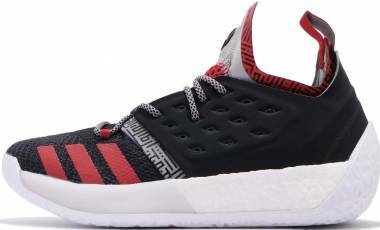 The Marquee Boost Low is said to be inspired by the vintage Adidas Streetball. 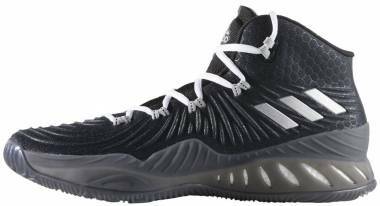 These black Adidas basketball shoes are available with hints of either purple, yellow, green, and white. 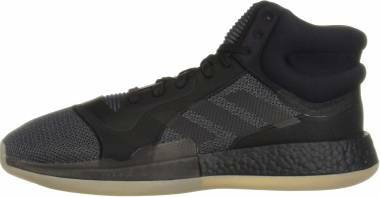 The Adidas Marquee Boost also has a mid-top version. 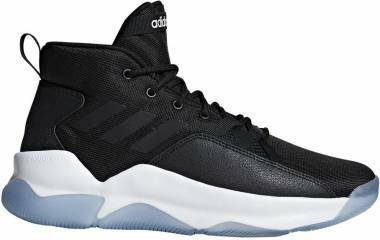 Another pair of black and white basketball shoes that are a hit among buyers is the Harden Vol 3. They in a special Cosmos colorway. There are also basic colorways of Black/Red, Black/White, and White/Black for new shoppers to choose from. 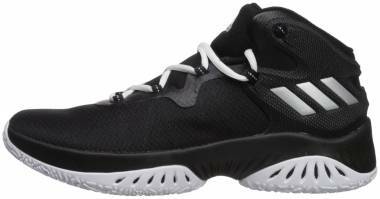 The next shoe that people go crazy about is the N3xt L3v3l. 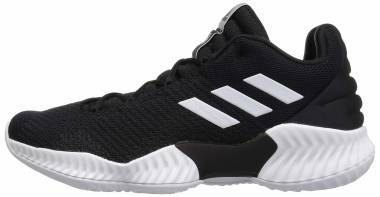 This is also the first laceless basketball shoe from Adidas There are reports that a lot of men and women enjoy dressing up with the shoe. Men pair it with slim pants. 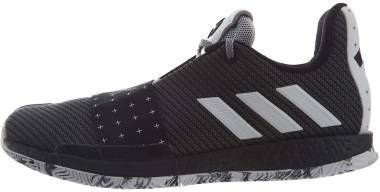 As for women, they wear it with running, yoga, and workout capris because of the sock-like ankle fit of these black and white adidas basketball shoes. 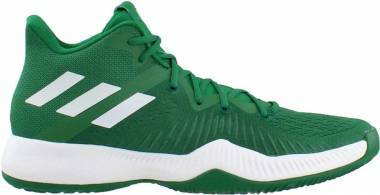 There are too many other attractive Adidas basketball shoes in the market. 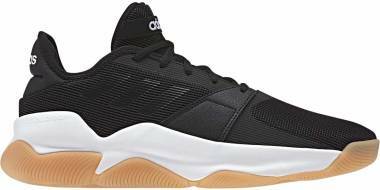 If black and gold Adidas basketball shoes are preferred, the Mad Bounce 2018, Pro Bounce 2018, T-Mac Millennium, Dame D.O.L.L.A., D Rose 9, and HARDEN B/E X MVP are good options. 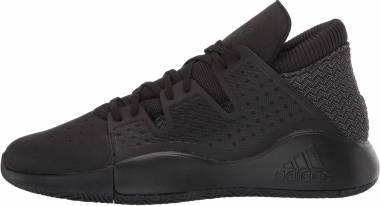 There are also those who love all black basketball shoes. According to one reviewer, all-black is the sleekest colorway there is. The bold color makes him feel discreet yet powerful. 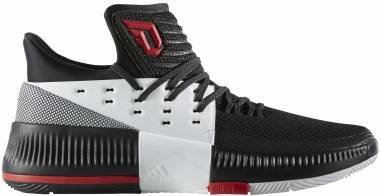 Triple black Adidas basketball are quite rare but the Dame 4, the Harden B/E 2, and the D Lillard 3 come in such a rendition. 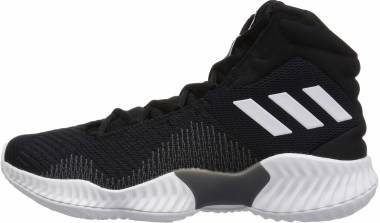 If all-black Adidas basketball shoes are quite plain and boring, accents of white can give a pop of color and light. 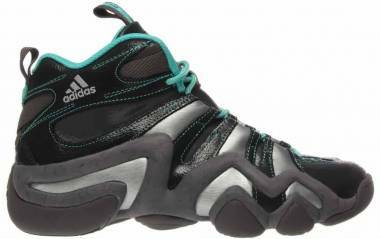 Adidas offers models that come in such renditions. 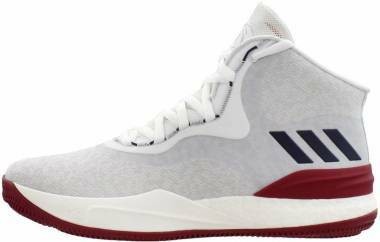 These models are the Pro Vision, Explosive Bounce 2018, Crazylight Boost 2018, Rose Lethality 2018, Harden Vol. 2 LS Lace, and Pro Spark 2018. 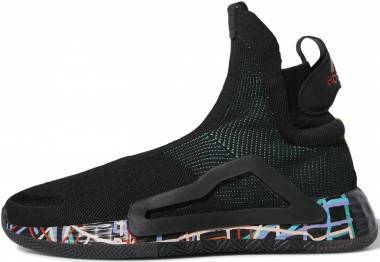 If one wants a more unique look, they can definitely go for the Adidas Crazy BYW X. They can choose from a variety of options: Black/Blue/White, Core Black/Core Black/Bluebird, and Core Black/Ftwr White/Real Purple S18 colorway. 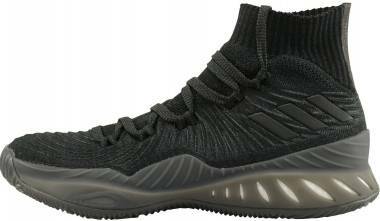 Black Adidas basketball shoes are never difficult to match. Black is considered neutral to it goes well with any other color. 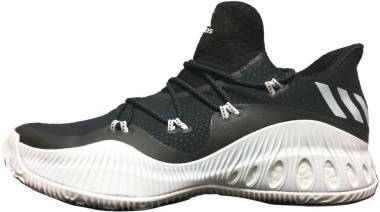 Some brides and debutantes even dare wear black basketball sneakers on their important days. The key is to pick whatever is suitable and comfortable. Black is a mysterious and beautiful color. It is basically the absence of light. The color was first introduced by the Proto-Indo-Europeans. 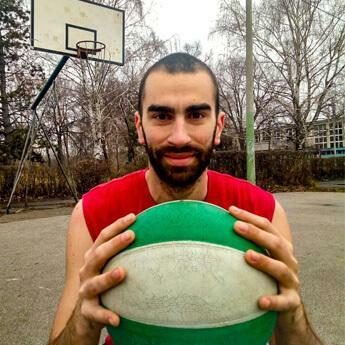 This ancient ethnic tribe uses the word “bhleg-” which means to gleam or burn. In the 16th century, Englishmen used the word black to pertain to people with dark skin or those who were professional mourners. This dark hue is full of meaning, both positive and negative. It has secrets and emits protection. Its positive characteristics include power, strength, confidence, containment, comfort, convention, self-control, discipline, intelligence, and dignity. In movies and stories, black resembles beginnings and endings. Black has several negative characteristics as well. It includes fear, death, evil, aggression, gloom, unfriendliness, sadness, emptiness, pessimism, depression, and rebellion. When it comes to communication, black represents intimidation. When women wear black lingerie, they empower sexiness and seductiveness. When men wear formal attire, such as black tuxedos or evening jacket with matching trousers, it depicts sophistication, formality, elegance, authority, and professionalism. There are those who have a gothic fashion sense. They wear all-black outfit, black accessories, black hair, and black eyeliner. To achieve the perfect get up, they will really want to pair these with all-black Adidas basketball shoes.